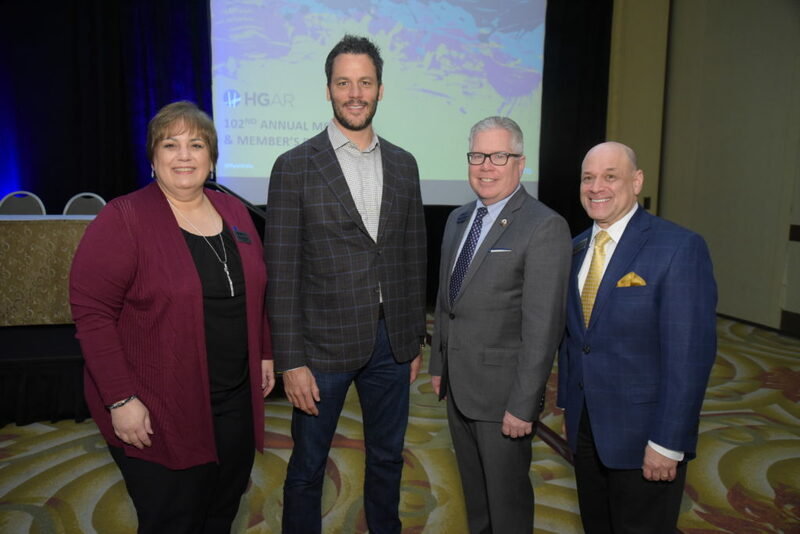 TARRYTOWN—A record crowd of approximately 1,500 members and affiliates attended the 102nd Annual Meeting and Member’s Day of the Hudson Gateway Association of Realtors held on Oct. 29 at the Doubletree Hotel in Tarrytown. 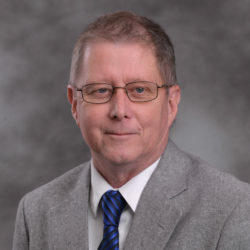 During the association business portion of the program, HGAR membership elected the 2019 slate of HGAR directors that will be headed by 2019 HGAR President Ron Garafalo. Members also approved some bylaws amendments in connection with the pending formation of a new regional Multiple Listing Service that will be co-owned by HGAR and the Long Island Board of Realtors, Inc.
Other HGAR officers that will serve the association in 2019 are: President-elect Gail Fattizzi; Treasurer Irene Guanill Elukowich; Secretary Crystal Hawkins Syska and Immediate Past President Barry Kramer. The day-long event featured educational seminars and compelling presentations covering Realtor safety, ethics, economic development and marketing, highlighted by keynote speaker and top performing sales professional and leader Ryan Estis, who gave a spirited talk before a standing-room-only crowd of HGAR members. 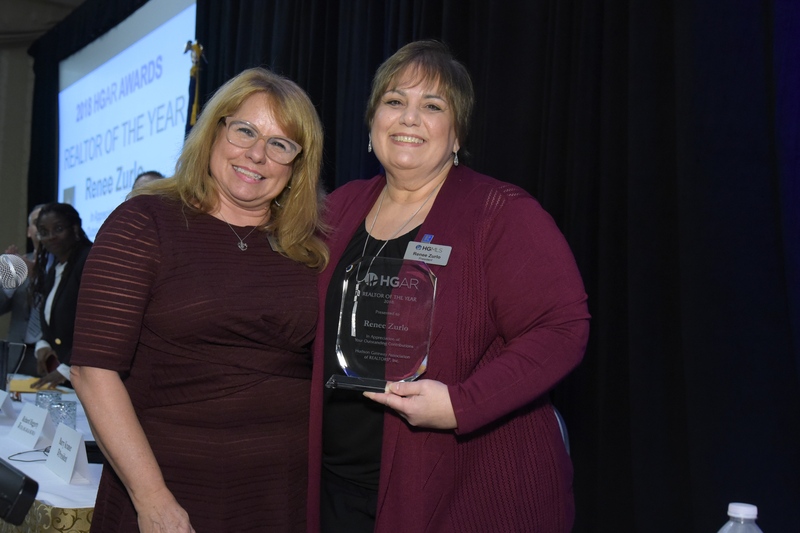 The HGAR Recognition Committee, chaired by Terri Crozier, also revealed the association’s top award winners that included its 2018 Realtor of the Year Renee Zurlo of Better Homes and Gardens Rand Realty in Central Valley and 2018 Affiliate of the Year William Jansz, senior officer, branch administration of Trustco Bank. Zurlo is currently the president of the HGMLS and will continue in that role in 2019 until the new and yet-to-be-named Multiple Listing Service is officially formed and in operation. Zurlo has been a Realtor for almost 25 years and has served as president of the HGMLS for the past three years. She has been very active in the association for many years, serving on several councils and committees. She is also a certified New York State real estate instructor. Before entering the world of real estate, she was a full-time mom for 10 years. After joining a Hudson Valley firm in 1994, her entrepreneurial spirit led her to open her own agency, which eventually grew to more than 40 agents. A few years later, she became part of the BHG Rand family of real estate offices. Jansz has been a continuous supporter of HGAR over the years, sponsoring and attending countless association events. Jansz has worked with Trusto Bank for more than 15 years and oversees branch operations throughout the lower Hudson Valley. Opening its first branch in upstate New York in 1902, Trustco now has 148 branch locations on the East Coast and 20 branch locations throughout Westchester, Putnam, Dutchess, Rockland and Orange counties. • Spirit Awards: Crystal Hawkins Syska of Keller Williams New York Realty in White Plains and Emi Cacace of Portico Realty Group in Scarsdale and Manhattan. Both are co-chairs of HGAR’s Fair Housing & Cultural Diversity Committee. • Extra Mile Awards: Ray Hollingsworth Falu of Hollingsworth Real Estate in White Plains and Irene Guanill of Meet the Sellers in the Bronx. Both co-chair HGAR’s Broker/Owner/Manager Committee. President’s Award: Gail Fattizzi of Westchester Real Estate Inc. in Somers. 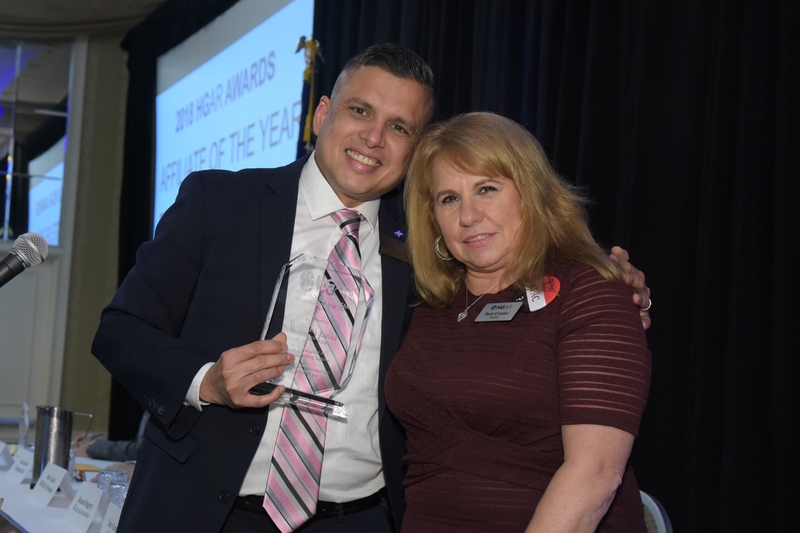 Fattizzi, who serves as Secretary/Treasurer for the HGAR Board of Directors, was chosen by HGAR President Barry Kramer for her hard work and dedication throughout the year. Stephanie Crispinelli Humanitarian Award: Christopher Greco of Richard Greco Real Estate in the Bronx. Greco founded Christopher’s Voice, a non-for-profit organization created to help families of autistic children. He is also a decorated police detective, president of the Police Association of New Rochelle, and the recipient many police awards. Up & Coming Award: Richard Herska of Better Homes and Gardens Rand Realty in Nyack. Herska is co-chair of HGAR’s RPAC Committee (Realtors Political Action Committee). Edward I. Sumber Memorial Award: (The award was created this year in memory of Ed Sumber, who served as the Association’s legal counsel from 1975 to 2015. Ed passed away in June 2018.) John Dolgetta of Dolgetta Law in White Plains. Dolgetta was Sumber’s partner and now serves as HGAR’s outside Counsel. During the Annual Meeting, HGAR officials gave special recognition to NAR Emeritus Members for 40 years of service—Marilyn Light, Pat Held and Linda Clark—as well as HGAR staff who have reached significant milestones of service to the association. Jennifer Andriach, HGMLS Accounting Manager, 10 years; Kristine DiFrancesco, Director of MLS Training, 10 years; Lisa Andrade, Education Coordinator, 20 years and Leah Warncke, HGAR Accounting Coordinator, 25 years. The event also featured association updates provided by HGAR President Kramer, CEO Richard Haggerty and HGMLS President Zurlo. The association thanked Premier Sponsor O’Donnell & Cullen Property Tax Consultants and Cocktail Party Sponsor A.S.A.P. Mortgage Corp. for their support of Member’s Day, as well as the 67 exhibitors that participated at the event. For further coverage of the 102nd HGAR Annual Meeting and Member’s Day see the November print edition of Real Estate In-Depth. John J. Lease REALTORS Inc.
3451 E. Tremont Ave., 2nd Fl. 75 S. Broadway, 4th Fl. The Hudson Gateway Association of Realtors is a not-for-profit trade association covering more than 11,000 real estate professionals doing business in Westchester, Putnam, Rockland, and Orange counties, as well as the Bronx and Manhattan. It is the second largest Realtor Association in New York, and one of the largest in the country. The Hudson Gateway Multiple Listing Service (HGMLS), owned and operated by HGAR, offers some 24,000 properties in the Bronx, Westchester, Putnam, Dutchess, Rockland, Orange, Sullivan and Ulster counties. It is among the top 50 largest MLSs in the country.